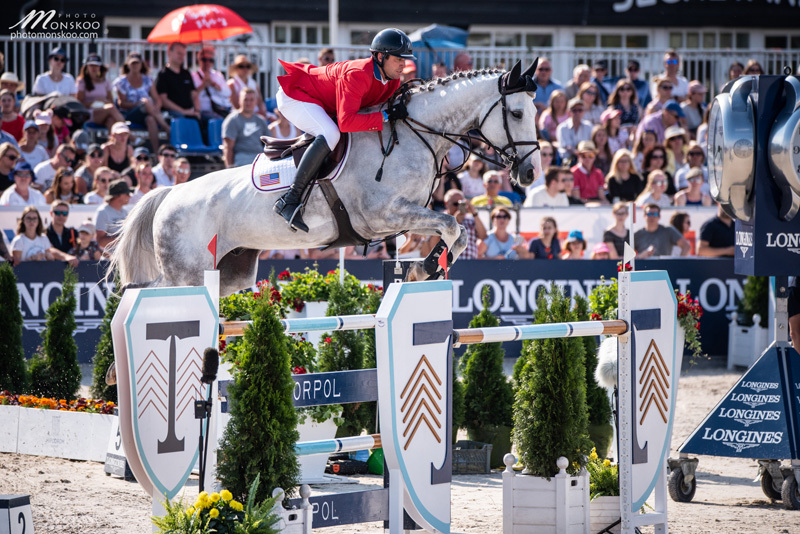 The NetJets U.S. Show Jumping Team placed third in the Longines FEI Jumping Nations Cup Poland on Sunday, June 17, at the Lotto CSIO Sopot. The team of Jamie Barge and Luebbo, Margie Engle and Royce, Lillie Keenan and Super Sox and Devin Ryan and Eddie Blue was led by Chef d’Equipe Robert Ridland. The team came out of round one on eight faults over a course designed by Germany’s Olaf Petersen Jr. They tied with France and Germany for third place, while Belgium led with one fault and Sweden sat in second on four faults. Keenan, of New York City, started the team out with nine faults on Super Sox, Chansonette Farm, LLC’s 12-year-old Hanoverian gelding, and were the drop score. Finishing with four faults were Barge, of Malibu, California, and Luebbo, Kylie Co.’s 13-year-old Oldenburg Springpferd gelding. The all-important clear trip came from Ryan, of Long Valley, New Jersey, riding Eddie Blue, LL Show Jumpers, LLC’s 9-year-old Dutch Warmblood gelding, while Engle, of Wellington, Florida, and Royce, Gladewinds Partners, LLC’s 14-year-old Oldenburg stallion, anchored the team with four faults in the opening round. Devin Ryan and Eddie Blue. Photo by Monskoo Photo. In the second round, Keenan and Super Sox improved their score to eight faults, while Barge and Luebbo had a rail and a time fault for a total of five. With an unfortunate rail at fence nine in the second round, Ryan and Eddie Blue added four faults to the team’s score. Rounding out the team results were Engle and Royce, who placed second in Friday’s Longines Grand Prix CSIO*****. They added four faults as well and put the U.S. on a total team score of 21 faults for third place. Ryan put in the team’s best performance of the day with Eddie Blue. After going clear in the first round just under the time allowed, Ryan wanted to perfect his second round and avoid time faults but ended up with a rail at the triple bar. This was Ryan’s first ever Nations Cup competition, and while he noted it’s “another day in the office,” the team atmosphere was supportive and aiming for the top. Belgium topped the podium with 13 faults, while France placed second on 16 faults.